As the second of the two 4th round draft picks by the Tennessee Titans in the 2014 NFL Draft, Daquan Jones joins a very loaded defensive line. Jones is a former offensive lineman turned to the dark side at Penn State where he played primarily on the defensive line. Like fellow 4th round selection Marqueston Huff, Jones is a versatile player who can play both inside and out on the defensive line. While Jones can play outside where many think he projects as a 5 technique, he seems to me more ideally suited to play inside and could help fill the Titans need for a nose tackle in their new hybrid defense. At 6′ 4″ and 322 pounds, he is quite a load. 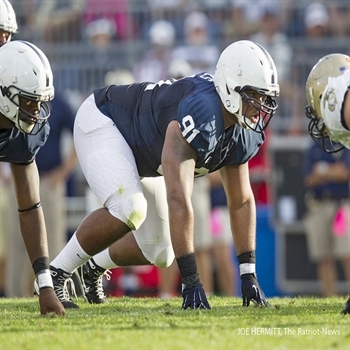 He was expected to redshirt his first year at PSU but ended up earning playing time. He would finish his college career with 86 tackles, 45 solo, 13.5 tackles for a loss, 3.5 sacks, and 1 pass defensed. He earned first team All Big Ten honors. The Titans have 13 defensive linemen on their roster right now including Derrick Morgan. Morgan might end up playing outside linebacker but for the time being we will list him at defensive end. I expect the Titans will carry 8 and possibly 9 defensive linemen so not everyone is making this roster. The Titans have several players like Morgan drafted for the 4-3 defense but they are transitioning to a hybrid under new defensive coordinator Ray Horton. Jones played in virtually every position on Penn State’s 4-3 defensive line. He can penetrate and disrupt the pocket and also plays the run really well. Just a shade smaller than Albert Haynesworth, his film recalls memories of watching Haynesworth play. Like Haynesworth, he has been tagged with the slacker effort at times. Another player that came to mind when watching Jones was San Francisco Forty Niner defensive lineman Justin Smith. Jones is a bit bigger than Smith but he has some traits that would allow the Titans to use him much like the Niners use Smith. Jones is the kind of player who can play outside in base and then slide inside in a subpackage to disrupt and occupy blockers. Positions on the Titans defensive line should be up for grabs with no one really having a solid lock on any given position. That makes this position battle the most interesting to me and the one that should receive a lot of attention when the Titans open training camp later in the month.